As any parent knows, road trips with the family during the school holidays rarely lend themselves to a restful time. Research is required if weary families are to find ways to keep kids in cars occupied for hours at a time when they’d rather be running around burning off energy. Fortunately, we’ve done the leg work for you. Here is a selection of the best in-car games and accessories that will help keep journeys as peaceful and harmonious as possible. The safest car seats you can buy for young children are rear-facing. But this poses the obvious problem: how do you see what they’re up to? 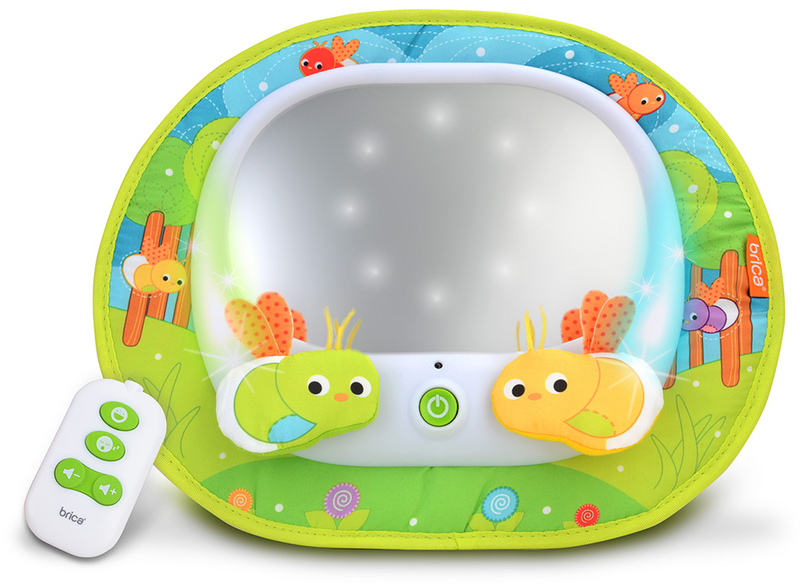 The Brica Magical Firefly Mirror doubles as both a mirror that mum and dad can keep an eye on, and an entertaining LED light display complete with fall-asleep lullaby tunes. It attaches to the headrest of the back seat, and has a remote control so it can be silenced once its job is done. Back seat drivers start from a young age these days. So treat them to this simple sat-nav device, which may not offer real world guidance, but is just the job for toddlers. 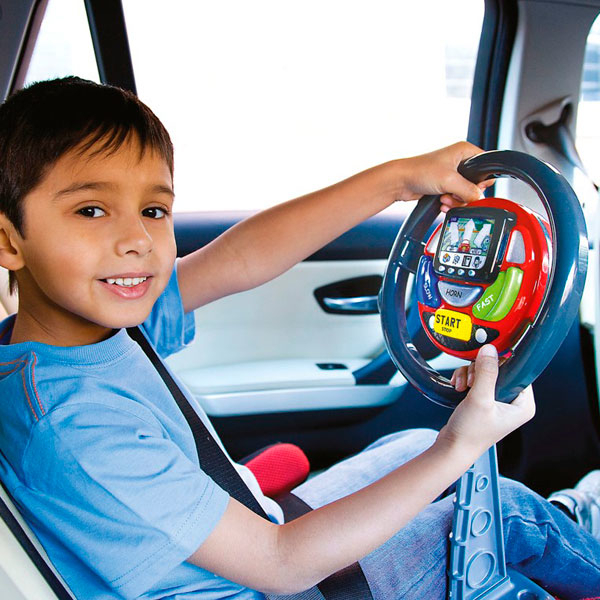 Mounted on a stand, it reads out instructions for little ones to follow, and the battery-powered console features buttons on the steering wheel which should be pressed in response to the commands. Galt is a British company with over 175 years’ experience of making toys for children, and it seems to have got it down to a fine art. 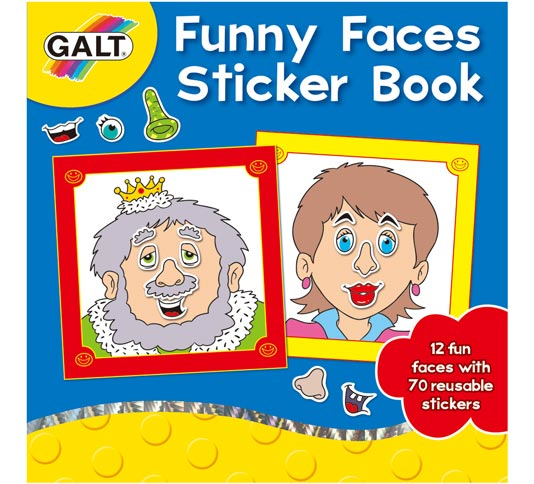 Before setting off on your journey, hand the kids a Funny Faces Sticker Book, and once you’ve arrived the results should be worth a giggle. There are 12 faces and 70 reusable stickers so the fun doesn’t have to stop when the journey is over. Fed up with the inevitable ‘Are we there yet?’ question? Try an Enid Blyton audio book. Ideal for children over five-years old, these will keep them gripped for hours on end and this audio download set features eight titles, including Five Have a Puzzling Time, Five and a Half-Term Adventure and A Lazy Afternoon. How appropriate for holiday high jinks. For really long journeys by car, a film is a fantastic way to help children relax and unwind as the miles pass by. If you already own a tablet such as the Apple iPad but don’t have a mount, the SD Tabletware is an affordable and secure mount. It’s easy to fit (using Velcro straps) and doubles as a protective cover when at home. 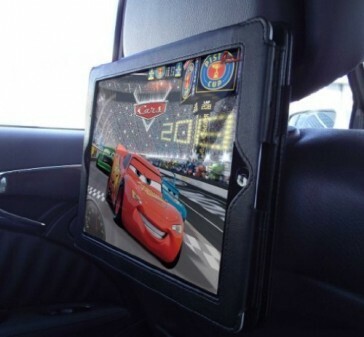 It features a screen cover that sends the iPad to sleep, and fits most makes and models of car. If you don’t want to spend money on gadgets or games and prefer traditional family entertainment, try ‘Keep the Beat’, an in-car sing-along game that should raise plenty of laughs. The idea is simple: someone selects a song on the car’s audio system, and nominates a player who must continue to sing along in time with the beat once the music is momentarily switched off. When it is switched back on, everyone finds out whether they can keep to the tune.